Up For Sale 2012-2016 BMW F10 M5 FRONT LEFT DRIVER SIDE SEAT LEATHER BLACK OEM. NOTICE: SEAT HAS SIDE AIRBAG DEPLOYED AND IT NEEDS TO BE REPAIRED AS SHOWN ON PICS. SEAT IS IN USED CONDITION SHOWS SIGNS OF WEAR, DENTS, TEARS AND SCRATCHES/IMPERFECTIONS. Up For Sale 2012-2016 BMW F10 M5 FRONT RIGHT PASSENGER SIDE SEAT LEATHER BLACK OEM. SEAT IS IN USED CONDITION SHOWS SIGNS OF WEAR, DENTS, TEARS AND SCRATCHES/IMPERFECTIONS. SEATBELT BUCKLE IN SEAT IS NO GOOD IT IS DEPLOYED YOU WILL NEED TO REPLACE IT. Selling a used fully functioning passenger front seat off a 2013 bmw m5 with 32k miles the seat had heated cooled massage options in it all work the seat airbag is intact and good also have the whole interior available if interested can sent more pics if interested SEAT IS IN USED CONDITION SHOWS SIGNS OF WEAR, DENTS, TEARS AND SCRATCHES/IMPERFECTIONS. SEATBELT BUCKLE IN SEAT IS NO GOOD IT IS DEPLOYED YOU WILL NEED TO REPLACE IT. 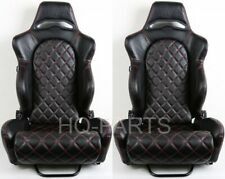 2 X TANAKA BLACK PVC LEATHER RACING SEAT RECLINABLE DOUBLE LOCK SLIDERS & DUAL RECLINER & DIAMOND STITCH. FULLY RECLINABLE WITH DOUBLE LOCK SLIDERS & DUAL RECLINER & DIAMOND STITCH. Diamond Stitch. PVC Leather- BLACK. I AM ALSO PARTING OUT 2013 BMW M5 F10. Hawaii, Puerto Rico and Alaska. 2 X TANAKA BLACK PVC LEATHER RACING SEAT RECLINABLE DOUBLE LOCK SLIDERS & DUAL RECLINER & RED DIAMOND STITCH. FULLY RECLINABLE WITH DOUBLE LOCK SLIDERS & DUAL RECLINER & RED DIAMOND STITCH. Diamond Stitch (Red stitching). 2 X TANAKA UNIVERSAL BLACK & RED PVC LEATHER RACING SEAT RECLINABLE DOUBLE LOCK SLIDERS & DUAL RECLINER & BACK POCKET. Hot Stamping TANAKA logo on front & back. Dual Recliner. FULLY RECLINABLE WITH DOUBLE LOCK SLIDERS & DUAL RECLINER & BACK POCKET. 2011 BMW 535i F10 Body Style Sedan. Front Left Driver Side Seat Headrest Grey. We recycle OEM parts. New opened box item in mint condition. 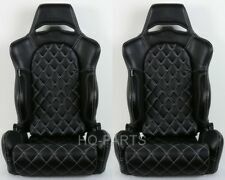 FOR SALE WE HAVE A 2013 13 BMW M5 SEDAN OEM FACTORY BLACK LEATHER REAR SEATS ASSEMBLY F10 #1063. THIS ITEM IS USED AND MAY SHOW SIGNS OF IMPERFECTIONS SUCH AS SURFACE SCRATCHES AND SCUFFS. -IF A ITEM HAS BEEN ALTERED OF ITS PHYSICAL AND FUNCTIONAL FORM IN ANY WAY, IT VOIDS TAE AUTHENTICITY. Quick shipping from multiple locations in the USA! _gsrx_vers_836 (GS 7.0.14 (836)). -IF A ITEM HAS BEEN ALTERED OF ITS PHYSICAL AND FUNCTIONAL FORM IN ANY WAY, IT VOIDS TAE AUTHENTICITY. 2011 BMW 535i F10 Body Style Sedan. We recycle OEM parts. Since this is a used part it might signs of use. 2 X TANAKA BLACK PVC LEATHER RACING SEAT RECLINABLE DOUBLE LOCK SLIDERS & DUAL RECLINER & BLUE DIAMOND STITCH. FULLY RECLINABLE WITH DOUBLE LOCK SLIDERS & DUAL RECLINER & BLUE DIAMOND STITCH. Diamond Stitch (Blue stitching). 2 X R1 STYLE BLACK & BLUE PVC LEATHER RACING SEAT RECLINABLE DOUBLE LOCK SLIDERS. FULLY RECLINABLE WITH DOUBLE LOCK SLIDERS. These seats are designed for universal fit. BLACK & BLUE. Universal fit for 95% of vehicles. Wagon E61N 535xi 2008-2010. Sedan E60N 528xi 2008-2010. Sedan E60N 535i 2008-2010. Sedan E60N 535xi 2008-2010. Sedan E60N 528i 2008-2010. Sedan E60N 550i 2008-2010. Sedan E60 525i 2004-2005. Sedan E60 530i 2004-2005. 2 X R1 STYLE BLACK & RED PVC LEATHER RACING SEAT RECLINABLE DOUBLE LOCK SLIDERS. FULLY RECLINABLE WITH DOUBLE LOCK SLIDERS. These seats are designed for universal fit. BLACK & RED. Universal fit for 95% of vehicles. 2 X R1 STYLE BLACK & GRAY PVC LEATHER RACING SEAT RECLINABLE DOUBLE LOCK SLIDERS. FULLY RECLINABLE WITH DOUBLE LOCK SLIDERS. These seats are designed for universal fit. BLACK & GRAY. Universal fit for 95% of vehicles. Sedan E60N 550i 2008-2010. Sedan E60N 535xi 2008-2010. Sedan E60N 528i 2008-2010. Sedan E60N 528xi 2008-2010. Sedan E60N 535i 2008-2010. Sedan E60 530i 2004-2005. Wagon E61 530xi 2006-2007. Sedan E60 550i 2006-2007. 2011 BMW 535i F10 Body Style Sedan. Front Left Driver Side Seat Cushion Lower Bottom. We recycle OEM parts. Made from high quality materials, black cloth with red stitching. 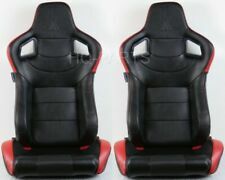 2 x Racing seats w/ slider ( 1 x driver's side & 1 x passenger's side ). 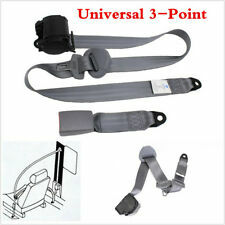 2 x 5 point cam lock harness seat belts. Deep thigh bolster for driver's support in the seat. It is used in Seat/ front/ lumbar -- Seat/ front/ lumbar Active seat --. Sedan E60 M5 04/2007-2010. Sedan E60 545i 04/2007-and on. Sedan E60 530i 04/2007-and on. Sedan E60 525i 04/2007-and on. Sedan E60 530xi 04/2007-and on. It is used in Seat front head restraint -- Seat front head restraint base seat -- Seat front head restraint Sport seat --. SAV/SUV E70 X5 3.0si 06/2010-and on. SAV/SUV E70 X5 3.5d 06/2010-and on. SAV/SUV E70 X5 M 2010-2013. Wagon E61N 535xi 2008-2010. Sedan E60N 535xi 2008-2010. Sedan E60N 528i 2008-2010. Sedan E60N 528xi 2008-2010. Sedan E60N 535i 2008-2010. Sedan E60N 550i 2008-2010. Sedan E60 M5 2006-2010. Wagon E61 530xi 2006-2007. It is used in Seat front head restraint -- Seat front head restraint base seat -- Seat front head restraint Sport seat --. New Century BMW. Sedan F02 ALPINA 2011-2012. 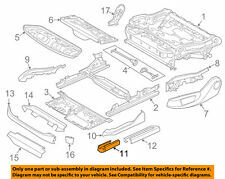 Sedan F10 528i 2011-2011. Sedan F10 535i 2011-2013. 2011 BMW 535i F10 Body Style Sedan. 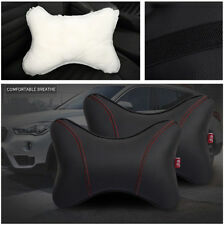 Front Right Passenger Side Seat Cushion Upper Backrest Grey. 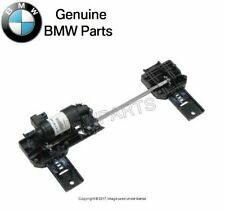 We recycle OEM parts.